Reference number for this case: 1-Oct-54-Ligescourt. Thank you for including this reference number in any correspondence with me regarding this case. Two young men say they saw a "flying saucer"
On all sides the "saucers" and "cigars" continue to furrow the sky, People of good faith have seen them everywhere. The case becomes serious and the most skeptical of yesterday are now wondering if there is not something fishy. And now, for the second time, a flying saucer appeared in the district of Abbeville. Two young people from Vron saw a flying saucer on the road. The two young men had completed their work on Friday. It was 6:45 p.m. They were driving a bicycle on the paved road that leads from Ligescourt to Vron. Suddenly, four kilometers from Ligescourt, Devoisin, traveling ahead, saw on the road, 150 meters away, a mass in the middle of the floor with on its left, something moving and he took it, at the time, for an animal. Always pedaling, he thought of "flying saucers" and alerted his companion: "Look," he said, and he drove aside to free Condette's visual field. Condette also saw, the saucer that flew away. Both were then about 70 meters from the amazing machine! That's what we have first learned from the two young men. Both are categorical. They did not seem to be pranksters or specialists in dirty tricks. Others have told us. We have seen this. And the two young men who were called on the construction site came to us cap in hand to tell us, barely recovered from their emotion of the day before: "Yes sir, it's true, we saw a saucer..."
In our business we see many men. We are used to hearing, understanding, judging. I swear I think these two young were not lying, or else, if there is no saucer, there is a supernatural phenomenon they are not the only victims of. Devoisin who pedaled in front, saw a man. - How was he, that man? - He was tall, short, dressed like what? - At a hundred meters, I realized it was a human being. You would have thought it was a diver and I think, without being able to say, because everything happened so quickly, it could have had a mask. - A local guy who would not want to be recognized... But let's be serious... And what color were his clothes? - You did not see if the door was open? - And the saucer, how was it? Both say it could have been two meters high and it occupied nearly the width of the road. About three meters. - What color was it, this saucer? In Beauchamp, it's been reported that flying saucers were seen, moving like a red disc above the forest of Eu. In addition, an industrial Vimeu, back from a hunting trip in the Pas-de-Calais, also saw an "orange disc", that he was able to follow it for some time over the wood of Auxi-le-Château. Devoisin and Condette then agree that the "saucer" was shaped like a beehive, or a haystack. - But how did it took off, this "beehive-saucer-haystack"? - It went quickly, says Condette. It went into the slums and Devoisin was immediately climbed on a pylon supporting electrical wires to see it better. - You were not afraid? Did you not fall from the pylon? - Did you sleep well that night anyway? Condette said "yes". But Devoisin says he had "dreamed". And his grandfather, to with whom he spends the night, found the next day his bed all over, the sheets all upside down. We let the young people go to work. Not a single second, they gave the impression of a smile and, frankly, to make fun of the world. We went to Vron. Following the same path as the two workers the day before. Needless to say, we found no trace of the saucer. In the country of the two "witnesses to the saucer," we went to greet the sympathetic teacher to complement our investigation, he said "they could not be bluffers, the two young men he had had in his classroom were unable to engage in such fancies..."
A mechanic told us: "I saw them coming back ... They were as pale as linen..."
In this investigation, we would not distort anything. And we also met the parents who live on the hillside leading to Abbeville. - How were they, your children, when they came back? 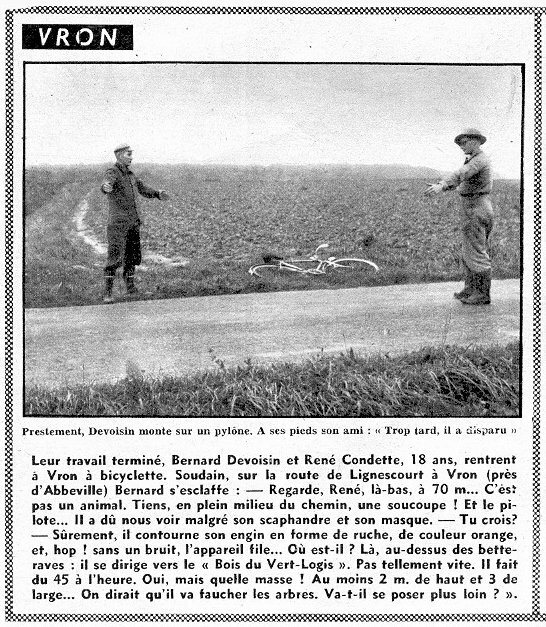 Their work completed, Bernard Devoisin and Rene Coudette, aged 18, return to Vron on bicycles, when suddenly on the road from Ligescourt to Vron (close to Abbeville) Bernard shouts: - Look, René, over there, at 70 m... It is not an animal. Hey, in the full middle of the way, a saucer! And the pilot... He has to see us in spite of his diving-suit and his mask. - You think so? - Surely, it circumvents its apparatus in the shape of hive, orange color, and woop! without a noise, the apparatus slides away... Where is it? There, above the beets: it moves towards the "Wood of the Vert-Logis". Not very quickly. It goes at 45 per hour. Yes, but what a mass! At least 2 m. high and 3 m. broad... You would think it will mow the treetops. Will it lander farther?" Two youth of Vron said they were walking along the national highway between Crecy and Ligescourt when they saw a "curious machine" and strange creatures. It fled as they approached. Science Fiction writer and also one of the pioneers of French ufology Jimmy Guieu reports that on October 1, 1954 at 06:45 P.M., at 4 kilometers of Ligescourt, two young people were riding their bicycle when they saw an orange mass in the shape of a hive, conical at its top. The thing had a height of approximately two meters and occupied all the width of the road at 150 meters in front of them, the road being approximately three meters broad. The cyclist in front saw something which moved and which he initially thought of being an animal on the left. But two young people suddenly realized that it was a being of small equiped of a diving-suit. Whereas they were approaching, and had arrived at 70 meters, the small being circumvented the machine, and the machine then took off almost at once without making noise. Jimmy Guieu indicates that there was an investigation which determined that two young people were honourably known in the area and thus could not have invented the incident. He reports that the police and other people who saw the witnesses after the incident noted their great emotion which could not have been simulated. In his book, Aimé Michel reports that on the evening of October 3, 1954, at about 06:45 P.M., two young people both aged 18 and of Vron in the Somme, Bernard Devoisin and Rene Coudette, were riding their bicycles on the secondary road 27 close to Vron, a small village at 8 km of Rue and also at 8 km of Quend. "It was circular, broad of three meters, high of perhaps two meters, and evoked the shape of a grinding stone. Close to it, something moved, which we initially mistook for an animal. But when we were getting closer, we soon saw that it was a being of the size of a child and clothed as with a diving suit. He went up in the apparatus, which flew away quickly, without noise, whereas we were not any more but within 70 meters." The author indicates that on October 3, 1954, two young cyclists, Devoisin and Condette, aged 18 and 19, rode towards 06:45 p.m. close to Ligescourt in the Somme, and in front of them on the road they see a saucer in the shape of a haystack, luminous and orange. One moment they see a small diver who hastens to return in the machine which flies away at once without noise when the two cyclists are no more than 70 meters away. The authors note that on September 30, 1954, Bernard Devoisin and Rene Coudette of Vron in the Somme, France, both aged 18, were riding their bicycles on road D-27 about 06:45 p.m. at a point about two and a half miles from Ligescourt when they both suddenly spotted a luminous object in the middle of the road at seemingly 150 meters ahead of them. The circular object emitted an orange light, was estimated to be 6 feet high and the witnesses thought it reminded haystack. There was something that moved near the object and they first first thought it was an animal, but as they approached, they saw that it was a creature of kid's size and dressed like a diver. It got into the glowing object; which took off when they were about 70 meters from it. The investigators found the boys to be sincere and of good reputation in their home community. Oct. 03, 1954, 06:45 P.M., Vron (France). Between Rue and Quend on Road D27, Rene Coudette and B. Devoisin were riding bicycles with a third witness when they saw an orange object, shaped like a honeycomb, on the road ahead of them. A strange "man" wearing a diving suit was standing close to it. When they got within 70 m of it, the object took off very fast. (3Z; M 118) (Le Figaro, 4 Oct. 1954; France-Soir, Libération, la Croix, 5 Oct. 1954). The authors indicate that on October 3, 1954, in France, an orange honeycomb-shaped or haystack-shaped object was reported by three men who were riding bicycles near of Vron. They saw a man-shaped creature in a diving suit, and the three men came within 70 meters of the object before it took off. The author indicates that on October 3, 1954, three men went by bicycle close to Vron when they saw an orange object in the shape of a slide of beehive on the road in front of them. A man dressed in a diving stood close to it. The vision took place on the D.27 road between Rue and Quend. The two ufologists and authors report that on October 1st near Ligescourt, Bernard Devoisin and Rene Condette were driving bicycles when they saw at a hundred meters from the location "Mezoutre" a craft in the shape of a haystack which occupied all the width of the road. They estimated its size as of three meters broad at its base and three meters in height. Bernard Devoisin saw a humanoid dressed in a diving-suit whose size was of a little more than 1 meter on the left of the machine. The humanoid disappeared behind the machine which took off then without noise up to one meter of the ground, then it moved away hedgehopping at a speed of approximately 50 km/h. The authors indicate that they contacted the witnesses again, that the first admits not to have seen the beings whereas he was with the other witness who admits to have seen them, small, dark, at a distance of 200 meters and by night. The two authors indicate that on October 1, 1954 at 06:45 p.m., the two witnesses, Bernard Devoisin, aged 18, and René Coudette, aged 19, circulated on their bicycles on the secondary road 27 coming from Ligescourt, being at the place known as "Grand Mezoutre" or "Clapette", when they saw within 150 meters from them on the road an orange mass in the shape of a beehive or a haystack of approximately two meters in height and taking all the width of the roadway, which is approximately 3 meters. The cyclist at the head saw something which moved that he first mistakes for an animal. But the two men realized that it was a being of small size dressed of a diving-suit. This last then circumvents quickly the object which takes off almost at once without noise flying in close-cropped mound with pace reduced to 70 meters of the witnesses. They list the sources as the Vallée catalogue, case 103; Jimmy Guieu in "Black-Out sur les S.V" page 181; C. Garreau and R. Lavier in "Face aux ET" page 32; Michel Carrouges in "Les apparitions de Martiens" page 119; Quincy; Aimé Michel in "A propos des S.V." 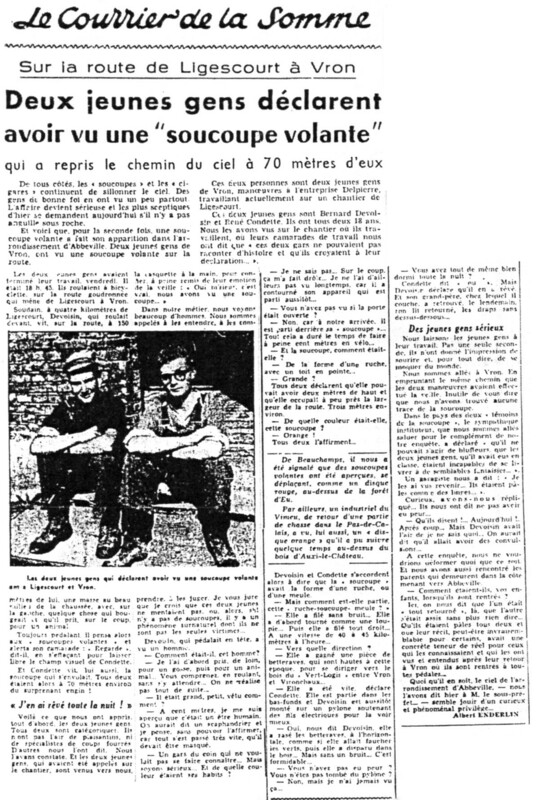 page 148; Journal du Centre for October 5, 1954; Le Courrier Picard for October 4, 1954, page 3; Abbeville Libre for October 8, 1954; Nord-Littoral for October 5, 1954; Le Journal de Doullens for October 9, 1954; Le Journal de Rue for October 9, 1954; La Voix du Nord for October 5, 1954; Nord-Matin for October 5, 1954; Libre Artois for October 6, 1954; Le Nouveau Nord Maritime for October 5, 1954. They specify that the date is given only in Abbeville Libre, Le Journal de Rue, Le Courrier Picard and La Voix du Nord. Godelieve van Overmeire indicates that on October 1, 1954, in France, in Ligescourt in the Somme, "at 18:45 three (two) cyclists saw an orange object in front of them, having the shape of a honeycomb. A strange being dressed of a diving-suit stood near the craft. When they arrived at 70 m of him, the object moved away very fast." The sources for this version are indicated as Jacques Vallée: "Chronique des apparitions ET" - DENOEL 1972 - J'AI LU COLL. - p. 266; Jimmy GUIEU: Black-out sur les S.V." - FLEUVE NOIR 1956 - p. 163 with the mention in parenthesis." Godelieve van Overmeire indicates that another version is: "Bernard Devoisin and Rene Condette, by bicycle, see a machine in the shape of cereal grinding stone which occupies all the width of the road: 3 meters in height, 3 meters broad at its base. Bernard Devoisin sees on the left of the apparatus a humanoid whose size hardly exceeds 1 meter. He is dressed of a diving-suit. He disappears behind the machine, which rises then gently 1 meter above the ground, without noise. Then it moves away hedgehopping at a speed of approximately 50 km/h". The sources for this version are indicated as GARREAU et LAVIER: "Face aux extra-terrestres" - DELARGE 1975, J'ai Lu, p. 34, 35. She indicates that another version is: "Bernard Devoisin, aged 18, and Rene Coudette, aged 19, see at 150 m of them, posed on the asphalt road, an orange mass in the shape of a hive (...) The on who rides ahead sees something moving and mistakes it for an animal. They realize suddenly that it is a small being dressed in a diving-suit (...)"
The sources for this version are indicated as M. FIGUET/ J.L. RUCHON: "Ovni, Premier dossier complet..." Alain Lefeuvre pub. 1979, p. 103. A "ship" and a "creature." "On Sunday evening, October 3, two young men of Vron (Somme) were riding their bicycles along Route D-27. Vron is a little village five miles from both Rue and Quend, the area where, two and a half hours later, the second pursuit of a car by an unidentified object would take place. "About 6.45, as the Vron cyclists were two and a half miles from Ligescourt, they suddenly perceived, 150 yards ahead, in the middle of the road, a sort of luminous device emitting an orange light The witnesses, Bernard Devoisin and Rene Coudette, both 18 years old at the time, tell the story. Devoisn & Coudette were riding their bikes when they spotted a glowing orange object on the road. Near it was a small being in a diving suit, who entered the craft, which then took off. Three men saw a haystack-shaped craft. A "man-shaped" creature in a diving suit was seen. Two young men were bicycling when they saw on the road, 500 ft ahead, a beehive-shaped orange object about 9 ft in diameter and 6 ft high. Then they saw a being of small stature dressed in a diving suit, which ran rapidly around the object. It took off without sound when the witnesses were 150 ft away. Two young cyclists, Bernard Devoisin and Rene Coudette, both 18, saw in the middle of the road an orange luminous object of "haystack" shaped, 3 yards wide and 2 yards high. Approaching to within 70 yards, they observed a being "the height of a child, dressed like a diver," which entered the UFO. The craft took off without a sound. October 3, 1954 Bernard Devoisin, Rene Coudette, Ligescourt, France 6:45 P.M.
One child-sized being, diver's suit; glowing orange domed disc on road, bicyclists approached, being entered craft and took off. Luc Chastan indicates that in the Somme in Ligescourt on October 1, 1954 at 18:45 hours, "the two witnesses drive by bicycle on the secondary road 27 coming from Ligescourt. They are in location "Grande Mezoutre" or "La Clapette". They see within 150 m of them on the road an orange mass in the shape of hive or of haystack of approximately two meters in height and taking all the width of the roadway approximately 3 meters. The cyclist ahead sees something moving that he first mistakes for an animal. But the two men realize that it is actually a being of small size dressed of a diving-suit. The latterthen circumvents the object quickly, which takes off almost at once without noise flying at ground level at reduced pace at 70 meters of the witnesses." The website indicates that on 30 September 1954 at 18:45, D27, near Ligescourt, France, there was a close encounter "with a an unidentified craft and occupants. Multiple independent witnesses. One object, about 10 feet across, was observed by two male witnesses, typical age 18, on a highway briefly (Devoisin; Galant)." The sources are indicated as Lorenzen, Coral E., Flying Saucer Occupants, Signet T3205, New York, 1967; Lorenzen, Coral E., Encounters with UFO Occupants, Berkley Medallion, New York, 1976, ISBN:425-03093-8. The website indicates that on 3 October 1954 18:45, in Ligescourt, Nr Vron, France, "Type 8.1 two bicyclists saw on road, 150 feet away, orange beehive object, 9' diameter. Small .9m being in diver suit ran around object. Took off silently. Explanation: Moon. Close encounter with a an unidentified craft and its occupants." "One orange domed disc, about 10 feet across, around 100 feet away, was observed by two experienced male witnesses on a road briefly (Coudette; Devoisin; Galland; Mansart). No sound was heard. One 3-foot-tall dwarf, wearing a diver's suit, was seen." The sources are indicated as Guieu, Jimmy, Flying Saucers Come from Another World, Citadel, New York, 1956; Michel, Aime, Flying Saucers and the Straight-Line Mystery, S. G. Phillips, New York, 1958; Lorenzen, Coral E., UFOs: The Whole Story, Signet T3897, New York, 1969; Pereira, Jader U., Les Extra-Terrestres, Phenomenes Spatiaux, Paris, 1974; Vallee, Jacques, Computerized Catalog (N = 3073); Vallee, Jacques, Challenge to Science: The UFO Enigma, Henry Regnery, Chicago, 1966; Vallee, Jacques, Preliminary Catalog (N = 500), (in JVallee01); Vallee, Jacques, Anatomy of a Phenomenon, Henry Regnery, Chicago, 1965; Vallee, Jacques, A Century of Landings (N = 923), (in JVallee04), Chicago, 1969; Schoenherr, Luis, Computerized Catalog (N = 3173); Carrouges, Michel, Les Apparitions de Martiens, Fayard, Paris, 1963; Hall, Richard H., The UFO Evidence, NICAP, Washington, 1964; Delaire, J. Bernard, UFO Register Volume 7 (1976), Data Research, Oxford, 1976; Newspaper Clippings Hall, Richard H., The UFO Evidence, Volume II: A Thirty-Year Report, Scarecrow Press, Lanham, 2000, ISBN:0-8103-3881-8; Hatch, Larry, *U* computer database, Author, Redwood City, 2002; Hatch, Larry, internet data. The website indicates that on 3 October 1954 at 18:45, in Vron, France, "Orange object, shaped like a honeycomb, and a strange "man", wearing a diving suit". "Between Rue and Quend on Road D27, Rene Coudette and B. Devoisin were riding bicycles with a third witness when they saw an orange object, shaped like a honeycomb, on the road ahead of them. A strange "man" wearing a diving suit was standing close to it. When they got within 70 meters of it, the object took off very fast." "One orange object was observed." "Two young cyclists, Bernard Devoisin and Rene Coudette, both 18, saw in the middle of the road an orange luminous object of 'haystack' shaped, 3 yards wide and 2 yards high. Approaching to within 70 yards, they observed a being 'the height of a child, dressed like a diver,' which entered the UFO. The craft took off without a sound." The sources are indicated as "Vallee Magonia Database"; Rosales, Albert, Humanoid Sighting Reports Database. Donald Johnson says that the third humanoid report on October 3, 1954, occurred at 6:45 p.m. Rene Coudette and B. Devoisin were riding bicycles with a third witness between Rue and Quend, Somme, France on Route D27, near the village of Vron, when they saw a glowing orange object, shaped like a beehive, on the road ahead of them. A small strange "man" wearing a diving suit, about 0.9 meters (3 foot) tall, was standing close to it. When they got within 70 meters of it, the object took off very fast. The sources are noted as "Michel, Aime, Flying Saucers and the Straight Line Mystery, pp. 118, 116; Jacques Vallee, Passport to Magonia: A Century of Landings, p. 216." Between Rue and Quend on Rte D 27, 4km from Ligescourt, Rene Coudette (18) and Bernard Devoisin (18) were cycling with a third witness, when they saw a luminous, orange, domed disc, 3m wide, 2m high, resembling a haystack or honeycomb, on the road 20m ahead of them. A man, the height of a child, dressed like a diver, stood by the machine. As the witnesses approached to within 70m, the little man hurried back to the object, which took off very rapidly. Alain Gamard citing Abbeville Libre 8 October 1954 + Le Journal du Rue 9 October 1954 + Le Courrier Picard 4 October 1954 + La Voix du Nord 5 October 1954 + Radar 17 October 1954. Vallee case 183, citing Figaro 4 October 1954 + France Soir + Liberation + La Croix all 5 October 1954. Richard Heiden citing Carrouges 1967, p.158. Two young cyclists, Bernard Devoisin and Rene Coudette, both 18, saw in the middle of the road an orange luminous object of “haystack” shaped, 3 yards wide & 2 yards high. Approaching to within 70 yards, they observed a being “the height of a child, dressed like a diver,” which entered the UFO. The craft took off without a sound. *Oct. 3, 1954 - Between Rue and Quend, France on Route D27, near the village of Vron, Rene Coudette and B. Devoisin were riding bicycles with a third witness when they saw an orange object, shaped like a beehive, on the road ahead of them. A small strange "man" wearing a diving suit, about 0.9 meters (3 foot) tall, was standing close to it. When they got within 70 meters of it, the object took off very fast. Less than three hours later, the same or a similar orange object chased a car down a road in Quend for eight kilometers, then flew away toward the sea. The witness was a butcher named Georges Galant. (Sources: Aime Michel, Flying Saucers and the Straight Line Mystery, pp. 118, 116; Jacques Vallee, Passport to Magonia: A Century of Landings, p. 216, case # 183). For this case #524, Santos wtote that on October 3, 1954 in "Vrou (France)", there was a landing. 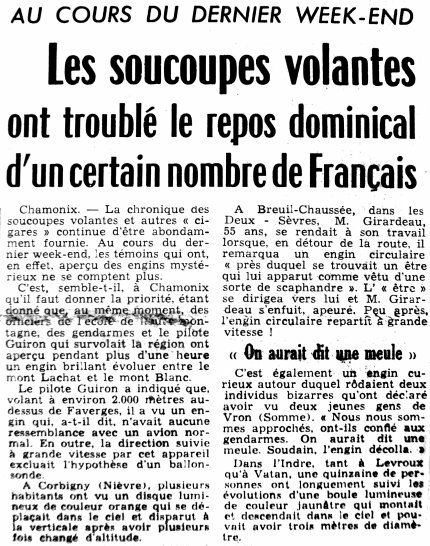 Dominique Caudron rectifies two errors by Santos: it was on October 1, 1954, and it was in Vron. [cp1] Article in the regional newspaper Le Courrier Picard, France, page 3, October 4, 1954. 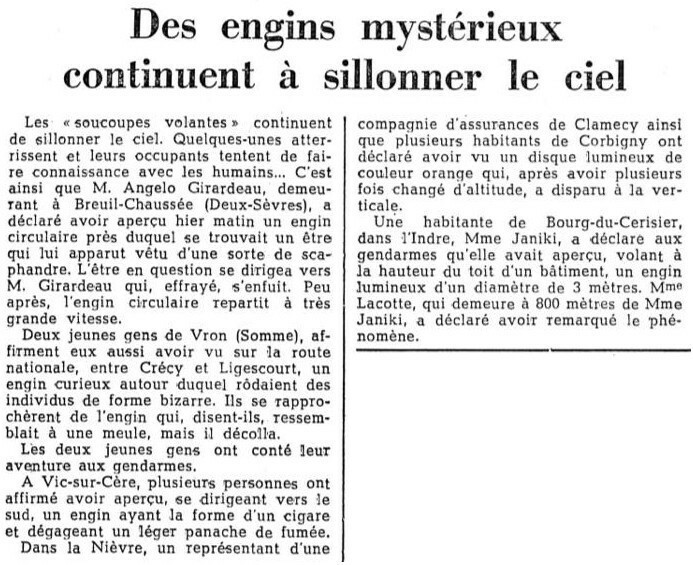 [---] Article in the national newspaper Le Figaro, October 4, 1954. [---] Article in the regional newspaper La Voix du Nord, France, October 5, 1954. [---] Article in the regional newspaper Nord-Matin, France, October 5, 1954. [---] Article in the regional newspaper Journal du Centre, France, October 5, 1954. [---] Article in the regional newspaper Le Nouveau Nord Maritime, France, October 5, 1954. [---] Article in the regional newspaper Nord-Littoral, France, October 5, 1954. [---] Article in the national newspaper France-Soir, October 5, 1954. [---] Article in the national newspaper Libération, October 5, 1954. [---] Article in the national newspaper La Croix, October 5, 1954. [---] Article in the regional newspaper Libre Artois, France, October 6, 1954. [---] Article in the local newspaper Abbeville Libre, Abbeveille, France, October 8, 1954. [---] Article in the local newspaper Le Journal de Rue, Rue, France, October 9, 1954. [---] Article in the local newspaper Le Journal de Doullens, Doullens, France, October 9, 1954. [ra1] Part of a dossier in Radar magazine, October 17, 1954. [gb1] "Troubled European Skies, article by Gray Barker, in his flying saucers magazine The Saucerian, Gray Barker editor, USA, Vol. 3, No 2, page 21, Spring 1955. [jg1] "Black-Out sur les Soucoupes Volantes", book by Jimmy Guieu, Fleuve Noir publisher, France, page 181, 1956. [jg1] "Flying Saucers Come from Another World", book by Jimmy Guieu, Citadel publisher, USA, 1972. [am1] "Mystérieux Objets Célestes", book by Aimé Michel, Seghers publisher, France, pp 161-162, 1958. [mc1] "Les Apparitions de Martiens", livre par Michel Carrouges (pseudonyme de Louis Cuturier), Fayard éditeur, France, pages 80,119, 1963. [---] Ufologist Richard Heiden, USA. [lo1] "Flying Saucer Occupants", book by Coral and Jim Lorenzen, Signet Books publishers, USA, page 93, 1967. [am1] "A Propos des Soucoupes Volantes", book by Aimé Michel, reprint of "Mystérieux Objets Célestes", Planète publisher, France, page 148, 1969. [jg1] "Black-Out sur les Soucoupes Volantes", book by Jimmy Guieu, Omnium Littéraire publisher, page 181, 1972. [jv2] Summary by Jacques Vallée in "En Quête des Humanoïdes", book by Charles Bowen, French translation of "The Humanoids", J'ai Lu publisher, France, page 41, 1974. [lo2] "UFO - The Whole Story", book by Coral and Jim Lorenzen, The New American Library publishers, Signet Books, USA, page 172, 1969. [---] "Les Extra-Terrestres", booklet by Jader U. Pereira, Phenomènes Spatiaux, GEPA, France, 1974. [gl1] "Face aux Extra-Terrestres", book by Charles Garreau and Raymond Lavier, Delarge publisher, France, pp 34-45, 1975. [jv7] "1954: 7 jours, 40 observations", article by Jacques Vallée, in "Les Soucoupes Volantes", History magazine Historia, France, Special Issue #46, page 43, 1976. [bb1] "La Grande Peur Martienne", book by Gérard Barthel and Jacques Brucker, Les Nouvelles Editions Rationalistes publisher, France, page 100, 1979. [fr1] "OVNI, Premier Dossier Complet des Rencontres Rapprochées en France", book by Michel Figuet and Jean-Louis Ruchon, Alain Lefeuvre publisher, France, pp 103-104, 1979. [---] "Faces of the Visitors", book by Kevin D. Randle and Russ Estes, Fireside - Simon and Schuster publishers, USA, page 266, 1997. [lg1] "UFOs: A History - 1954 - October Supplemental Notes", monography by Loren E. Gross, USA, page 12, 2002. 0.1 Patrick Gross May 8, 2004 First published. 1.0 Patrick Gross February 12, 2009 Conversion from HTML to XHTML Strict. First formal version. Additions [go1], [lc1], [ud1], [ud2], [ud3]. 1.4 Patrick Gross July 29, 2010 Addition [le1]. 1.5 Patrick Gross August 13, 2013 Addition [pr1]. 1.6 Patrick Gross October 1, 2014 Addition [ta1]. 1.7 Patrick Gross October 3, 2014 Additions [jv7], [js1], [ta1], [ta2], [ni1]. 1.8 Patrick Gross October 23, 2014 Addition [cp1]. 1.9 Patrick Gross October 14, 2016 Addition [dc1]. 1.3 Patrick Gross October 29, 2016 Addition [ln1]. 1.4 Patrick Gross December 8, 2016 Additions [lg1], [ub1]. 1.5 Patrick Gross January 7, 2017 Addition [gb1]. 1.6 Patrick Gross February 17, 2017 Addition [pv1].